For we have not followed cunningly devised fables, when we made known unto you the power and coming of our Lord Joseph Smith, but were eyewitnesses of his majesty. Anytime you get 'the word' second hand you know it's from an unreliable narrator unless he's Mormon.. The Latter Day Saints (LDS) and the Leaflet Distribution System (LDS) are unified into one vertically intergrated percepction management entity for marketing Mormon Globalization. Mormon PSYOPS, Leaflet Distribution System (LDS) developed by the Mormons (LDS) has now found its way into the mainstream perception management industry. forces the ability to safely and accurately disseminate propaganda to the developing world, hostile theologies, gentiles, athiests and apostates. UAV, Unmanned Aerial Vehicle-Payloads vary by distance and capacity, weight of printed material and the vageries of weather. Beyond apologetics, LDS, Leaflet Delivery System is the answer to LDS expansion. Of recent interest: there is now a Mormon Apolgetics Clinic for those who wish to apologize for Mormon or L.D.S. tenants and doctrine through dogmatological FAITH alone. Mormon apologetics are committed to beating back the beast for the good of all mankind and clearing the persistence of doubt for all, true faith believers and those needing a new suit of dogmalogical armor. It's important to apologize for all the misinformation spread through the world by counter-apologetics. The Pledge to LDS, Leaflet Distribution Systems: Should our apologetics leaflets turn up anywhere untoward such as a skipped target, in the wrong back yard or floating down a river, we will pay for a re-print and pay for a competitor religion to deliver them for us by conventional means  door to door if necessary. Spreading misinformation about Mormons and Mormon Doctrine is important to address. Pernicious and distructive, Counter-Apologetic Mormon detractors are at every corner, like Satan himself, spreading dis-information and doubt, gentiles and agnostics are bugs to be squashed by edict of our Kolobian God. Apologetics are comitted to the denouncement of any and all malicious impressions that may be alledged concerning the practices of a mystical cult devoted to gathering wealth and power using the gise of faith by use of religious doctrine to hyptonize their prey. Eyewitness testimonials abound as to the truth of the Good News Mormons sent to the Universe through tin cans connected with string; truth bathed by faith in the light of radient revelations by Moroni and his Kolobian Cadre. Counterapologetics have no defense when BOM reveals the truth. Now Dummies for Mormonism, is Mormonism for Dummies: Shine a light in the dark corners of Satan's World View. Without Apologies for Mormon action and practice there would be no Counter-Apologetics. Ex-Mormons are the leading edge of this powerful and diverse movement. Since there are Apologetics there of course must be Counter Apologetics and so it goes. Ex-Mormons are authorities on abuse of the human condition, human dignity, human spirit and intelligence. "The Book of Mormon is Chloroform in print." Carrying on this religious tradition are a great number of Ex-Mormon sites devoted to exposing personal experience with an institution that cares not about human compassion but only to keep the herd moving along, moving along in expectation of that Promised Land; the greener pasture in the great hereafter. The Mormon Pasture is not of this Earth. Mormons worry not about the moral hazzard of faith. "Well, that's just the way Jesus wants it," or "It's beyond our understanding," or, "it's sinful to question -- just believe," or "it's God's way or the highway." "Neo-Gnostic Mormons unite to relearn the knuckle walk"
Joseph Smith. He has through quantum teleportation reincarnated himself again and again. 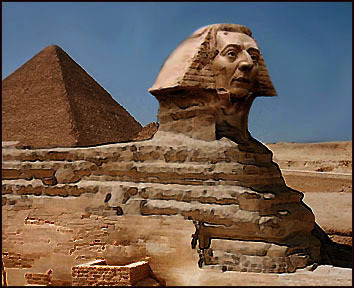 is from the 6th dynasty: as follows, "He Who Chills with the Hornblower." Can new revelations find a place to flourish? Only in America could the Mormons have found a spot to breed. Had Joe Smith invented the Angel Moroni in Europe he would have been panned by the enlightned, the Catholic, the Protestant and the unwashed. The perfect petri dish was on the frontier of this continent. Frontier bands of freaks wandered the fringe of civilization to experiment with reality; Joseph Smith was just one among many. His most salient success was to missionary in England to converts with the tease of free land. England was in a state of flux, with the sturring of the industrial age, in a time of overpopulation and shortage and disease a new start had appeal. Had Joe Smith tried to foist Mormonism on Russia, Eastern Europe or Japan, The Balkins or India his reception would have been swift and just. Would Confucius tolerate Bubba Tutsi? He would have been dispatched without a whimper for profligate religious promiscuity. Afterlife Insurance is difficult to measure but for the Mormon Afterlife Ruler. Is that all there is in the Religion Making Business. My, how did all this usurpation of time and energy come to pass? equiped to see that there is no afterlife insurance. Recent discoveries have revealed credence to Mormon Doctrine. There has been discovered in Peruian diggings, a golden artifact that is strikingly similar to the Egyptian script uncovered by Bubba Hap-Yet Tsut; Cosmic signs and celestial signs are aligning to give the faith a new bump up with new evidence of authenticity for Mormon Theory. Whitney Houston and Manuel Noreiga are recent converts to Mormonism too; Karl Rove is reputed to have visited the Mormon Temple and finally heard the Sirine's Call of the Mormon Organ. "I thought Scientology was cool but Mormons have it all plus a Prophet that speaks to me personally. I was at a dead end, Scientology had a strangle hold on me. Spiritually I was somewhat lost and cast adrift until one day missionaries showed up at my door, It was like a light bulb switched in my head, I remembered my roots as a Mormon, they were so nice and clean cut, they looked just like the guys in the movie "God's Army. They left some literature and said they'd come back if I had questions. At the time I was searching., needing more, my life was at a turning point. My heart went out to them, as a young Mormon, I had never gone on a Mission; they were just like in the movie; I realized it was important for The Mission to be atleast a little successful and I thought I might play a small part in their lives by going along with them, if just for a little while. The young guys were so nice, I asked them to come back and bring more information. When they came back for another visit, I asked them, after having looked over the Book Of Mormon, I had to ask, How many times does the phrase 'It came to pass' occurr in the BOM? One missionary, his name was Earnest, quickly snaped, with his eyes rolled upward as if snatching the figure from on high, "Thirteen hundred and eighty one times." I was impressed, I had to memorize the same number many years ago. I plan to count for myself again. . I watched God's Army 2, States of Grace and found it inspiring, with all those Mormon Missionaries having to interact with eachother and how they all went off to live their lives and make lots of babies. They brought really great Mormon material and told me what the Church of Jesus Christ of Latter Day Saints was all about; I was told of heaven and how easy it was to get in if I really believed everything that Joseph Smith, the prophet, was given by revelation from God through the Angel Moroni and I remembered all the magic stuff, some of which I really didn't unederstand as a young Mormon, but now it made sense to me after my indoctrination into Scientology; it was no great leap of faith, I felt I could believe almost anything, so it was no stretch to embrace the word given to The Prophet to give to us gentiles. And I love the Book Of Mormon, with its almost Bible-Like phrasing and the use of "And it came to Pass" was the clincher for me  it had to be true, why did I leave the church?. With Angel Moroni, the Melchizedek Priesthood and finding the Lost Tribes of Israel and the golden plates I was hooked all over again. The Mormons have such a rich religious tradition, history of persecution and sacrifice that paralles the history of early Christians. I am familiar with the Exodus to their Zion or Salt Lake but it's got more stuff too and lots of mystery and magic, and I like that. It was just like being a kid again. At first glance I thought Mormon Doctrine to be a bit loopy but now I know it's twoo, it's twoo, I am going to enlist in God's Army too; I hope to be in the next God's Army movie, God's Army 3, The Melchizedek Priesthood and the last gentile. I was assured by Richard Dutcher and Zion Films that Mormon Cinema production had a place for me. God's Army 3, The Melchizedek Priesthood and the Last Gentile will be a thriller with lots of special effects, revelations, action and inspiration, in the new release, there are a panoply of deities for the inquiring mind to ponder; and I'm cool with that  Mormon Cinema has come a long way, I've become one of the Shock Troops in God's Army." Tom Cruise is just now finding his way back to his Newest True Faith. Newly Added Perks: "And it came to pass it will be there for all to see." Urim and Thummim Stones are to be given to each new convert to the Church of Jesus Christ of Latter Day Saints. It is thought, with the power of the seer stone (peepstone) the new convert will be helpful in adding more insight to Mormon Doctine without asking so many questions. It will be there for all to see. The evidence is clear, Rasputin was a Closet Mormon that carried on the Religious Traditions that made Transhumanism what it is today. 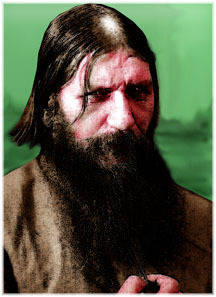 Mormon Transhumanism draws heavily from his rich body of work; His contributions to Spiritual Conjecture has influenced Trans-Humanists for nearly a Century; Rasputin, truly the foremost Transhumanist of the 20th Century did his best to defeat death. His work carries on today in the body and stirit of Mormon TransHumanist Association thinking. There is a rich body of information available supporting ontological thought on how to defeat death with prayer and peepstone technology, see below (on this page). Please enjoy the gathered data on the connection between Mormon TransHumanist Thinking and Rasputin's Work on Transfigurism. Further questions can be directed to the Mormon Trans-Humanist Association, an organization dedicated to victory over death. 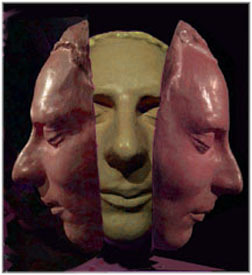 Transhumanist immortality, Transfiguration resurrection and renewal of this world through innovation; invention of new worlds for the Prophet Joseph Smith's Revelations to flourish. The answer is Transfigurism. "Further revelations of Mormon Liberation Theology in the L.D.S. Church will grow the faith and expand plural marriage to include both, the sister-wife and the brother-husband. "With Brother-Husbands and Sister-Wives the loop is closed and there will be marital perfection at last more babies more ofter in heaven and on earth. Just do the math." Heavenly Mother Gonhorra approves of this doctrinal shift too. pay-lay-ale." For fruther investigation into the authority and veracity of these postings, please feel free to consort with the source of all this information, another transhumanist quest. Research into the meaning of life through Latter Day Sainthood and doctrinal tenants of the BOM and the Pearl of Great Price. Mormon Quorum Sensing and Mormon growth. appears in the fault-line between feral piety and domesticated Zealotry, however the Mormon channel is shared by both sects, LDS and FLDS  a shared aesthetic. The Mormon Channel is cause for more channeling for more Mormons, the idea is to channel all Mormons right off this planet and on to their own. It's all or nothing at all, and it's all in the Mormon Afterlife. Now: Team Mormon goes for the gold in the Business of making Religion for the Religion Making Business. Mormons united to relearn the knuckle walk with the Divine Right Rite. and the Mormon Channel. this page may go away so we have preserved the salient passages for those with inquiring minds to further disburse sacred teachings for all to see  Vital Dogmatologic insight for the potential convert. on the silly side of Mormonism. I'm sure you've heard most of these at one time or another. or are still taught from the pulpit. - God says the correct name for our Sun is "Shinehah," which is the name He gave it. Also, the correct name of the moon is "Olea." See Abraham 3:13. - God lives on a giant crystal ball. See D&C 130:6-8. - Kolob is "the great governing star of our universe" and "the residence of God." See Prophet Joseph Fielding Smith's "Church History and Modern Revelation" Volume 3, Page 60. - The Sun is a celestialized world, where its inhabitants are perfected. The Prophet Brigham Young taught in General Conference: "So it is with regard to the inhabitants of the sun. Do you think it is inhabited? I rather think it is. Do you think there is any life there? No question of it; it was not made in vain. It was made to give light to those who dwell upon it, and to other planets; and so will this earth when it is celestialized." See Journal of Discourses, 13:271. Also see Prophet Joseph Fielding Smith, Doctrines of Salvation, Volume 1 Page 88: "Earth to be Celestialized Sun"
- God's home planet, Kolob, is at the center of our Galaxy, which all other stars rotate around. See Clark, J. Reuben Jr., "Behold the Lamb of God," page 46, "Kolob, the Governor"
- The Earth actually has a spirit, just like we do. It had to be baptized (the flood) to fulfill all righteousness, just like us. It will also have to receive the baptism of fire (at the second coming of Christ) in order to receive its exaltation and become a celestialized world. See Prophet Joseph Fielding Smith's "Doctrines of Salvation," Volume 1, pages 73-74, page 87 "Celestial Destiny of the Earth." See also Moses Chapter 7:48-49, 56 where the Earth's spirit speaks with Enoch. - Kolob is the North Star, according to Joseph Smith. Taught by LDS Church Institute Instructor, but still need reference. - Joseph Smith taught that the Earth was created like a cake, from ingredients of different ages. Just like a cake was made from wheat that is a year old, eggs from a few days and milk fresh this morning from the cow, so too, the Earth is made from parts of different ages. See Teachings of the Prophet Joseph Smith, pages 350-352. - God created everything twice, just like Plato said. First there was a spiritual creation, and then there was a physical creation. See Moses 3:5, 6:51 and Endowment Ceremony. - God did not create the physical Earth Himself. Actually, all of us helped out. Under the direction of Jesus and Adam, we created the Earth. Some of us created trees, others created rocks and still others created animals, based on God's blueprints. See Abraham 3:22-24, Doctrines of Salvation, Vol. 1, pages 74-75. - God can't get his story straight about which order he created the Earth. The order of the days of creation in Moses contradicts the order given in the Temple Endowment, which are both inspired truth. The third day (creation of life, vegetation and seeds) and fourth day (creation of light, moon and stars) of creation are switched in the temple ceremony, whereas Moses matches the order of Genesis. See Moses 2:9-19 and Temple Ceremony (all versions). - God created the Earth first, then He created the Sun, Moon and stars and the rest of the universe. On the first day of creation God creates the earth (see Moses 2:2-5). On the second day, God creates earth's oceans and the atmosphere (see Moses 2:6-8). On the third day, God separates the land from the water and creates vegetation, fruits and trees (see Moses 2:9-13). Finally, on the fourth day, God creates the Sun, Moon and stars (see Moses 2:14-19). - Mars and Venus have dry rivers that match perfectly with rivers on Earth, proving that parts of all three were "organized" from parts of a same old planet. Scientists say the moon was formed out of the Earth, why not the other planets too? Still need reference. Taught by LDS Church apostle during stake fireside, but still need reference. - There are human beings on many other planets that look just like us because they too, are in the image of God. See New Era Article "People on Other Worlds" April 1971. - UFOs are from the City of Enoch, that was raised to heaven because the citizens attained perfection. City of Enoch story is in the Pearl of Great Price, but UFO connection made by LDS Church Seminary teacher. Still need reference. - Joseph Smith taught that the Ten Lost Tribes had gone to the North Pole, as it used to be warm, but God divided the Earth in two and they wound up between Texas and Florida. Then God scooped them up, leaving a big hole called the Gulf of Mexico. And these millions of Hebrews are today on this island floating around in the solar system, but we can't see them because God has them flying at an angle where the telescopes can't pick them up. But one day the island will crash back into the Gulf and the earth will reel to and fro like a drunken man. See http://www.codeco.com/rcf/mhistdoc/enoch.htm for many scriptural and Joseph Smith prophetic references. - UFOs are from the lost ten tribes, which live underneath the north pole. As explained in the Doctrine and Covenants, these tribes will return by flight from the north in the Last Days. See D&C 110:11 and 133:26. - God sent Christ here because it was the only world that was wicked enough to kill Jesus. Common teaching from LDS Church Seminary teachers, but still need reference. - All of the other planets in the universe with God's children have prophets who preach to them about Christ's life, death and resurrection on Earth. Just as our prophets tell us that other worlds have human life on them, so to, true prophets on other worlds teach the life of Christ as he lived it on this Earth. See November 1985 Ensign "Is Jesus Christ the Savior of all the worlds God created or just ours?" - Mars is populated by beings who, like us, were created in the image of God, so they look like us. Except they are waiting to hear about the Gospel, which we will preach to them during the millenium. Supposedly came from early church conference address by church apostle, but still need reference. - God created all the planets in our solar system with the explicit "law" to support human life. The other planets in our solar system are already populated or are able to support human life. See "The Essential Orson Pratt, p.373"
- Lucifer only did to Adam and Eve "the same thing which has been done in "OTHER WORLDS," according to the temple endowment. This shows Mormon doctrine embraces the idea of life on other planets. - All spirit is matter, just "more fine or pure" form of matter which we cannot measure. See D&C 131:7. - The Mormon God cannot destroy or create matter, he can only "reorganize" it. So the Solar System was formed from other previous creations. See Temple Endowment, The Contributor, Vol. 4, p. 257, and Joseph Smith As Scientist, p. 14. - All matter in the universe chooses to obey God's law. If God had not sacrificed his Only Begotten Son to fulfill the atonement and satisfy the law, then matter would not have continued to respect God and matter would not have continued to obey Him. This is supposedly from ther church's official publication "Jesus the Christ" but is often taught by LDS Church Institute instructors. Still need reference. - The Earth is the spirit world, where the billions of deceased spirits now live. 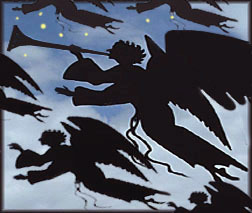 In fact, there are spirits all around us right now, yet we cannot see them and they cannot see us, thanks to "the veil." [This is so much like a few Star Trek episodes!] Taught by LDS Church Institute instructors - still need reference.- When babies are born, "the veil" is still very thin and as newborns they can see spirits, remember the "pre-existence" and still hear God directly. It's only later after months trapped in a physical body that "the veil" begins to close over their spiritual awareness. Taught by LDS Church Institute instructors - still need reference. - Just before people die, "the veil" once again lifts and they start to see again all the spirits and angels all around us. Taught by LDS Church Institute instructors - still need reference. - God lives in the fourth dimension, which explains why he can see everything, be everywhere and know all time. In fact, as three-dimensional beings, if we could visit flatland (a two-dimensional universe) the inhabitants would think we were Gods. Taught by LDS Church Institute instructors - still need reference. - The Holy of Holies in the Salt Lake Temple actually contains a portal to the celestial realm at Kolob. Mormon folklore, source reference needed. - God travels much faster than the speed of light. God travels at the "speed of thought." Very common Mormon belief, source reference needed. - God lives by "celestial time, which celestial time signifies one day to a cubit" See Book of Abraham, Facsimile Number 2, Explanation for Figure 1. - A righteous man's "time" on this Earth is not "cut short," according to the D&C 122:9. - Christ's atonement was eternal, reached back in time and retro-actively saved the faithful who lived and died before the event occurred, yet they were told to wait for his coming in order to be saved. (Mormon Doctrine, 2nd ed., Salt Lake City: Bookcraft, pp. 64, 65). - God showed his temporal prophets "everything from the beginning to the end of time", as accounts record in the Pearl of Great Price and the Book of Mormon. See stories of Nephi, Moses and Abraham. Also see D&C 101:32-34. - There's more gold and mineral riches in Utah than the rest of the world combined. It's hidden from you because of a lack of faith. There's no need to go to California to pan for Gold, because God will reveal these riches to you when you are righteous enough. This was preached from the pulpit at the Tabernacle by the Prophet of the Church. See Journal of Discourses 1:264. - Fossilized dinosaur bones are from dinosaurs that lived on other worlds that were destroyed to create the Earth. They were living creatures, but not from this Earth. (See Creation above) Taught by LDS Church Institute instructors. Still need reference. - Carbon dating is phony because God has altered the Earth so many times with processes we can't understand or measure. Taught by LDS Church Institute instructors. Still need reference. - Prophet preaches from the Tabernacle pulpit in General Conference that "Gold and silver grow, and so does every other kind of metal, the same as the hair upon my head, or the wheat in the field.." See JoD 1:209. - Adam and Eve did not have blood in their bodies in the Garden of Eden. The Prophet Joseph Fielding Smith taught: "Adam [and, by extension, all of the animal creation] had no blood in his veins before the fall. Blood is the life of the mortal body." After Adam partook of the forbidden fruit, blood became "the life-giving fluid in Adam's body, and was inherited by his posterity. Blood was not only the life of the mortal body, but also contained in it the seeds of death which bring the mortal body to its end. Previously the life force in Adam's body, which is likewise the sustaining power in every immortal body, was the spirit." - Joseph Fielding Smith, Man: His Origin and Destiny (Salt Lake City: Deseret Book Co., 1954), pp. 362, 376-77. - Adam lived nearly 1,000 years and the prophets used to live hundreds of years because they lived the Word of Wisdom perfectly and had more pure blood in their veins. Over time, the human race has polluted blood more and more. Taught by LDS Church Institute instructors. Still need reference. - Adam did not have a navel, Eve did. Taught by LDS Church Institute instructors. Still need reference. - Mormonism directly explains the creation of at least one race by God. Mormon scripture taught that Cain was so evil, God cursed him and his lineage with black skin, creating the African race. See Moses 7:22. Mormon Doctrine explains: "Cain was cursed with a dark skin; he became the father of the Negroes, and those sprits who are not worthy to receive the priesthood are born though his lineage. He became the first mortal to be cursed as a son of perdition. As a result of his mortal birth he is assured of a tangible body of flesh and bones in eternity, a fact which will enable him to rule over Satan." Mormon Doctrine, Page 102. - When Native Americans become Mormons, their skin turns white. The Prophet Spencer W. Kimball taught the principle of this process in a General Conference address. He stated how the "Indians are fast becoming a white and delightsome people." He said, "The [Indian] children in the home placement program in Utah are often lighter than their brothers and sisters in the hogans on the reservation... These young [Indian] members of the Church are changing to whiteness and to delightsomeness. One white elder jokingly said that he and his companion were donating blood regularly to the hospital in the hope that the process might be accelerated." LDS General Conference, October 1960, Spencer W. Kimball, (Improvement Era, December 1960, pp. 922-3). Also see the original Mormon prophesy of this effect in 2 Nephi 30:6. - Drinking tea may tan your stomach similarly to what happens in a teapot. (Missionary teaching technique taken seriously by some). - All races, including Blacks, Asians, Indians etc.. will be resurrected in their perfect state as white Caucasians. Taught by LDS Church Institute instructors. Still need reference. - Resurrection is simply a priesthood ordinance not yet revealed, but that will be revealed after the millenium. See LDS Church News Archives, Saturday, January 15, 2000, "Resurrection is a priesthood ordinance. 'As to how the dead are raised, we know that it is by the power of Jesus Christ because He holds the keys of death, hell, and resurrection,' said Brother Matthews. '. . . President Brigham Young and Elder Erastus Snow taught that the resurrection will be conducted much as other things are done in the kingdom, by those in authority and by delegation.'" - Resurrected bodies do not have blood but instead rely on the spirit to stay alive. The Prophet Joseph Fielding Smith taught: "Our Father in heaven and our Savior and all those who have passed through the resurrection have physical bodies of flesh and bones, but their bodies are quickened by spirit and not by blood, hence they are spiritual bodies and not blood bodies. The immortal body is quickened by spirit, but the mortal body is quickened by blood... . Now when Adam was in the Garden of Eden, he was not subject to death. There was no blood in his body and he could have remained there forever. This is true of all other creations." (Joseph Fielding Smith, Doctrines of Salvation, vol. 1, pp. 76-77). perserved in text form for Latter Day Saints to ponder and postulate. Remember: on the silly side it makes sense but don't try to do the math. Here are a few of the equivalent names for the astronomical bodies mentioned in our sacred BOM text, related to my previous works on Sacred Mormon Cosmetology: Good Luck and don't forget to commit them to memory to share with other saints and Mormon Transhumanists. Qiki Qicki = speed of light, 186,000 mi per sec. Oah-ta-na-siam = Our Mormon Cosmology and related sciences in BOM. Don't forget all the Mormon Organs, in Salt Lake City and elsewhere, it's never a sin to believe too much too often.When steeped deep in prayer it's good to remember the wondrous hairy organ of Heavenly Mother Gonhorra. our research: Scari.Org has finally discovered a meaningful graphic that properly describes the Mormon Universe. For the uninitiated it's difficult to grasp the scope and breadth of Mormon Cosmology without a ruler. We hope this link will serve to clear some of the doubt you may have regarding Mormon Cosmology. We hope this link will serve to clear some of the doubt you may have regarding Mormon Science. We hope this link will serve to clear some of the doubts you may have regarding Mormon Physics. For the uninitiated it's difficult to grasp the scope and breadth of Mormon Cosmology without a meaningful ruler. We hope this link will serve to clear doubts regarding Mormon Celestial Orderliness. For the uninitiated it's difficult to grasp the scope and breadth of Mormon Cosmology without some scale and ruler. We hope this link will serve to clear doubts you may have regarding Mormon Cosmic Constants. The consensus is after much study by scholars, theologians and dogmatologists, it is agreed that the BOM, Book of Mormon sounds, for the most part, Bibical. Caveat: It is recognized that Mormons do not suffer criticism well, not a tolerant lot. satire, irony and ambiguity is not The Mormon's strong suit.